Sunday December 24th 1922 The girls put the house in order and placed the packages. I was finishing some things and cleaned up my room. I find I have written 37 letters and made 40 gifts. The day is pleasant as spring. 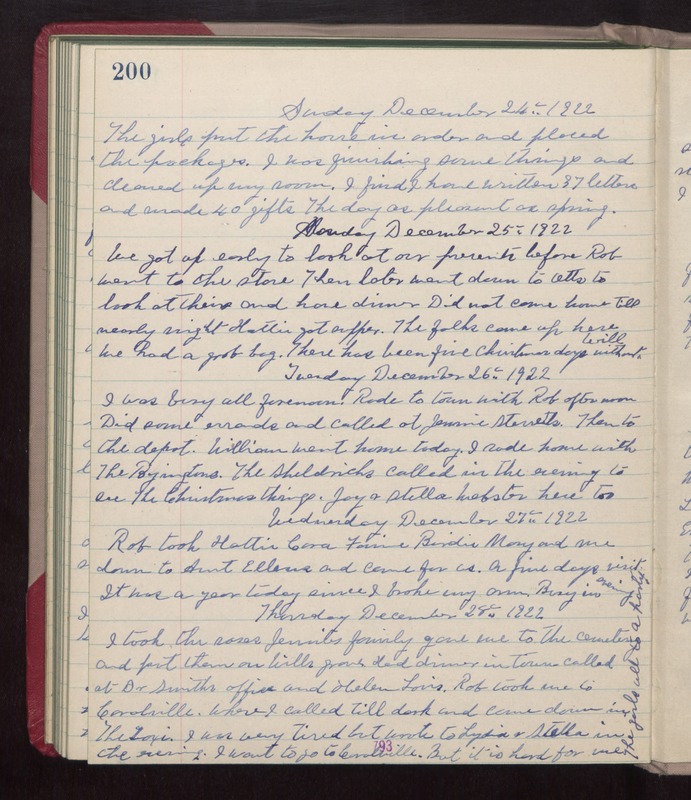 Monday December 25 1922 We got up early to look at our presents before Rob went to the store. Then later went down to Otts to look at theirs and have dinner. Did not come home till nearly night Hattie got supper. The folks came up here. We had a grab bag. There has been five Christmas days without Will. Tuesday December 26 1922 I was busy all forenoon. Rode to town with Rob afternoon. Did some errands called at Jennie Sterretts. Then to the depot. William went home today. I rode home with the Byingtons. The Sheldricks called in the evening to see The Christmas things. Jay and Stella Webster here too. Wednesday December 27 1922 Rob took Hattie, Cora, Fannie, Birdie, Mary and me down to Aunt Ellens and come for us. A fine days visit. It was a year today since I broke my arm. Busy in evening. Thursday December 28 1922 I took the roses Jennies family gave me to the cemetery and put them on Wills grave. Had dinner in town. Called at Dr. Smith's office and Helen Louis. Rob took me to Coralville where I called till dark and came down in The Taxi. I was very tired but wrote to Lydia and Stella in the evening. I want to go to Coralville but it is hard for me. The girls all to a party.